This is an old horse. Pinky the One-Eyed Wonder App has been retired and boarded with me for nearly twelve years. Pinky is a very lucky old horse. His owner fell on rough times and contacted me, and we worked out a decreased board so that she could still afford the costs of keeping Pinky healthy and happy to the end. Not all old horses are so lucky. Last month one of the horse mags ran a survey asking what their readers had seen or experienced personally in the Unwanted Horses arena. Another mag (or maybe it was the same one . . . I'm old; I forget) asked what readers' plans were for the coming year given the state of the economy. Good questions! I wonder, though, how honest the answers were. I doubt that anyone had the guts to admit that they are dropping regular dentistry. And I don't think I saw anyone say that they were forgoing vaccinations or cutting back on hay and grain or avoiding the horse shoer. Yet in conversations with Average Joe the Horseowner, those are the answers I'm hearing. A rant about penny-wise-pound-foolish decisions would be appropriate, but I like my blood pressure where it is. Instead, I'm going to dissect and comment upon an editorial in one of those horse mags wherein the editor suggested in a well-worded article and a tongue-in-cheek essay that instead of pushing for more breeding, and instead of the competition among breed registries for bigger numbers, it's time to stop registering new horses and start registering new horse owners. She suggests that a lack of new horsemen is a contributing factor in the number of unwanted horses. I suggest otherwise. I suggest that more owners who aren't ready for the responsibility or can't afford to pay the freight is not an answer. I suggest that more people allowing horses to get by on minimal care isn't an improvement. I suggest that the Horse Biz take a huge step back, put itself on Time Out, and rethink how best to address the Horse as House Pet misconception. We need to stop worrying about retraining horses and address retraining horsemen. AQHA has a Professional Horseman registry, which is very nice. I want a Professional Horse Owner registry, with a test (I like the CHA levels 1 and 2 standards myself) and certification required before any honest seller will release a horse into a buyer's hands. The breed registries might, in good conscience, step up now and do something about wanton horse buying. There's no time like the present while a new slaughter bill is working its way through Congress. Stop the problem at its source, and the business will suffer briefly then move on in a much saner direction. Pinky gives the idea two hoofs up. This is Leo. Leo does not have a Facebook page. Leo is not the one procrastinating by spending hours playing around online. That would be me. But, in my own defense, my internet addiction has led to two positive events. 1. I have become truly adept at flash room escape games. 2. I have reconnected with a very nice man who once gave me some of the best advice I've ever had with regard to horses. I'm not going to belabor the room escape thing. You can do your own gaming at www.jayisgames.com. Instead I'll point out the benefits of networking. Once upon a miserable day, I needed help. 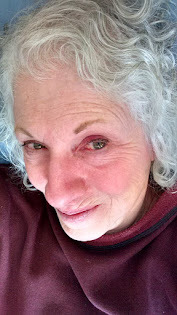 I had a brand-new horse, a pregnant mare, who I bought foundered and who was abscessing to the point where I worried that her feet would just rot off before the foal arrived. It was 1996. I was already a member of several horse forums, but this was an issue other chatty horse owners hadn't been able to address with anything but sympathy. 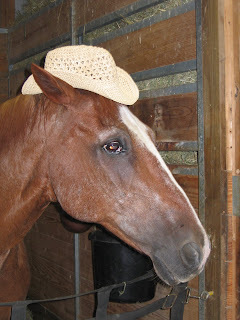 So I searched "hoof problems in horses" and came up with a site: www.horseshoes.com. I posted the query under "farriers helping owners", and I waited. Long story short, Henry Heymering, horse shoer and founder of the Journeyman Farrier's Association, came up with a plan. I applied said plan, and . . . what ho! The problem was resolved. Facebook enters into this because another friend had lured me there some time back with a "please be my friend" offer. That forced me to set up a page which I didn't visit again (as I was not in procrastination mode) until a couple of weeks ago when I got another of those "friend" offers. The timing was perfect. I needed an excuse not to go outside or work on the books I've got percolating or clean the house. I answered the request, then killed an hour with the search utility. I was surprised to discover that familiar name. Henry was not only a Facebook presence, but a former college classmate of mine. Who knew? Neither of us remembered the other, but that doesn't matter. I can live with senility. I can't live with having to do housework. If you're looking for something to do to while away some time, give Facebook a try. Works for me! What's this got to do with crummy weather and bored horses? Absolutely nothing. This is a non-sequitor of the finest kind. This is about taking time to wonder about the relationships we've built with other species. He would like to marry me. Sadly, marriage to a Goffins involves ear-piercing shrieks, so I'm not buying into it. Were we both living in the wild, inter-species marriage would not even be an issue. We would never have met, or if we had, it would have been in an even more adversarial situation as he would have been plundering my crops, and I would have been using something more lethal than the Slipper of Death, currently the only long-range weapon in my arsenal, to keep the amorous bird at bay. We all know about horses and how it always surprises noobs when they discover that horses play, think, emote, and create drama to keep themselves occupied and mimic their genetic memories of life in the wild. But have we also watched them relate to other animals? 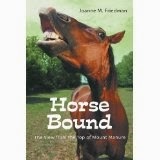 If you've got a dog, cat, ferret, hippo, or other pet, have you spent time watching them relate to the horses? I happen to have a herd of eight or so deer who hang out with the horses. They don't play together. They don't seem to care much at all about each other. They just share the space. It's a little like a bunch of wild animal species in, say, the Serengeti all marching to the water to drink, but not appearing to notice each other. I'm sure they do notice that there are other animals nearby, but there is no reason for them to interact, so they don't. My horses are used to the cats, coyotes, groundhogs and other mammals and could care less about the assortment of birds following them around picking undigested grain out of their manure. But we humans relate to all of them whether we need to or not because we're nosy and contentious. Got deer eating your daisies? Groundhogs in the tomato patch? Sparrows (damn sparrows!) in the hay loft? A raccoon or two living under the tool shed? Notice how intensely interactive you are with them. They are competitors for your space, and you take it very personally. That's not to say that you don't occasionally befriend an injured fawn. There's something about damaged lifeforms that speaks to humans in ways only we understand. Horses avoid injured animals. Injured animals suggest a predator is near. If it's not near right now, it will be when it sees that there's an easy mark available. Humans aren't that smart. Humans, therefore, get limbs ripped asunder by predators whose meals we are stealing when we aim to doctor up some poor, sad creature Mother Nature had already put on a predator's dinner plate. And we wind up betrothed to lonely cockatoos. Anyway, bad weather gives ample opportunity for reflection. Spend some time just watching the world. You might be surprised by what you learn.